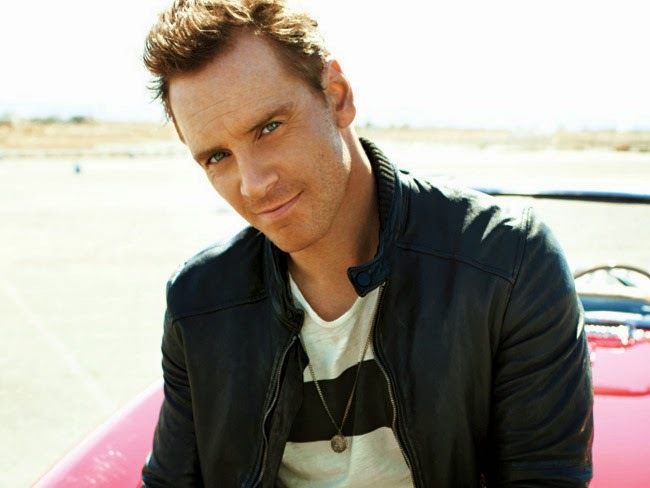 Fassinating Fassbender - A Michael Fassbender Fan Blog: Thank you for Supporting the Fundraiser! I woke up this morning and noticed that two more donations came through just after midnight. Thank you Danielle E for your kind donation, and Martha made her second donation, bringing our total up to £903! That is excellent my friends! Fundraising can be very difficult and challenging, and when there are other fundraisers begging for your attention and money, you are forced to decide which fundraiser deserves your money. 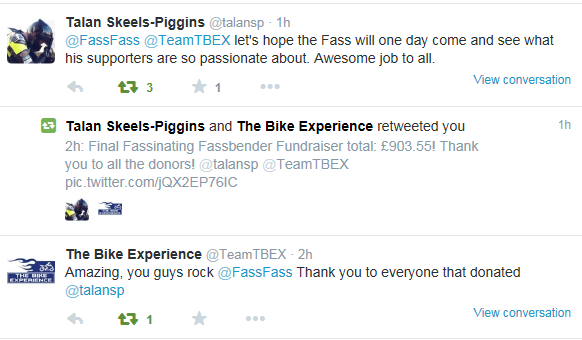 So for those who felt that The Bike Experience, which is sponsored by Fassinating Fassbender, deserved your support, I humbly bow to you all and graciously thank you for your donations this year! Donors, look out for a special email later today. The birthday announcement greeting has been sent off and Michael will receive it. All who donated have their name on the birthday greeting! Tomorrow, on Michael's birthday, I will announce the winner of the raffle prize, so come back here and check it out! Lastly, I look forward to helping TBE again next year, my support for them is even stronger now because of the personal messages I have received from donors. This is a unique charity and they feel especially compelled to help TBE because it is a charity that celebrates life and living for the moment! Here is a screengrab of a thank you message from Talan and The Bike Experience! It is really awesome how there was a push right at the end! I really enjoy donating to TBE. I follow the postings that Talan shares with us. It makes me feel so happy when I see the riders enjoying their sessions. This is such a worthy cause that even if Michael's name was not attached to it I would want to contribute. But thanks to Michael (and you Simone) I became aware of TBE. Look forward to contributing to TBE in the future. You have such a fantastic attitude regarding the charity that Fassinating Fassbender chooses to support for Michael's birthday fundraiser. Thank you Martha. I'm proud to support TBE!